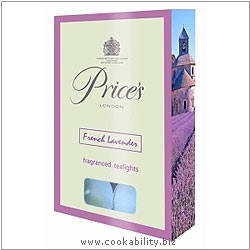 Price's Fragrance Range is a fabulous selection of delicate fragrances complemented by beautiful graphic designs. Synonymous with the lavender fields of Provence in Southern France, lavender is relaxing, herbal and an absolutely classic fragrance. Approx 3.8cm diameter and 1.8cm tall with burn time of approx. 4.5 hours under ideal conditions.